Special Containment Procedures: Any wild colonies of SCP-1238 are to be destroyed as soon as possible until such time as SCP-1238 can be reduced to and maintained at pre-1850 population levels. The Foundation shall liaise with the National Oceanographic and Atmospheric Administration, and with other oceanographic research institutes as necessary, to track SCP-1238 movements and attempt to locate entrances to SCP-1238 tunnels. Any tunnel discovered should have its entrance sealed by any means necessary that will not result in seismic instability until such time as a means of completely filling in existing tunnels or rendering them structurally stable is developed. The Foundation is to monitor seismic activity within the Gold Zone at all times for indications of new tunnel construction or evidence that Event 638-Mu-34 is imminent. Whenever possible, persons living above known tunnels should be relocated. No other SCP objects, except those the nature of which renders them immovable, are to be contained within the Gold Zone. No mission-critical Foundation personnel are to travel, remain, or operate within the Gold Zone except as necessary to monitor SCP-1238 or other SCP objects within the area. No member of the O5 Council is to enter the Gold Zone at any time. Personnel whose "home town" is located within the Gold Zone, or who have immediate family members residing within the Gold Zone, are disqualified from participating in SCP-1238 containment. In the event that Event 638-Mu-34 is determined to be imminent, all Foundation personnel are to attempt to evacuate the Gold Zone immediately Foundation personnel within the Gold Zone are to effect immediate evacuation of high-ranking government officials, military personnel, and culturally significant individuals as per Plan Contra-IK-638, and to secure the retrieval and removal of listed artifacts of cultural or historical value, before attempting to evacuate themselves. Mobile Research Unit 638 is to remain on site within the Gold Zone and transmit observations and data to Overwatch Command until such time as environmental conditions render communication impossible. Following Event 638-Mu-34, the Foundation is to liaise with national governments and employ its resources for humanitarian purposes as necessary to prevent escalation to an IK-class collapse-of-global-civilization event. 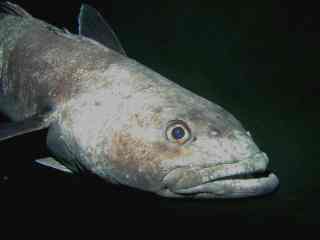 Description: SCP-1238 is a species of deep-sea fish with no current taxonomic classification, morphologically similar to the Antarctic toothfish (Dissostichus mawsoni). SCP-1238 resides principally in deep waters in the northern Pacific Ocean, along the northwestern American and western Canadian coastlines. Adult SCP-1238 specimens measure on average 1.4 meters in length and weigh 100-110 kg. SCP-1238 is not suitable for human consumption due to the large concentrations of toxic minerals consumed by the fish, and are not currently fished for in any significant quantity or exploited by human industry for any significant purpose. During most of its life cycle, SCP-1238 specimens subsist primarily on a diet of smaller fish and other small aquatic animals. During spawning season, which lasts from approximately early April to mid-July each year, the secondary digestive tract of sexually mature SCP-1238 specimens becomes active, allowing the fish to digest and metabolize inorganic minerals and metals, particularly deposits of metamorphic rock located below a region of the northwestern United States and southwestern Canada designated the Gold Zone. During spawning season, SCP-1238 will gather en masse at specific sites along the ocean floor and begin a process of tunneling under and through the continental shelf, widening and expanding the tunnel as a result of their consuming the existing rock. During spawning season, an adult SCP-1238 fish can consume and metabolize approximately 120% of its body mass in minerals within a 24-hour period. SCP-1238 produces little waste matter during this stage - volume of waste excreted is approximately 10% of that consumed. Tunnels produced by SCP-1238 in this manner become the spawning grounds in which SCP-1238 eggs are laid and fertilized. A female SCP-1238 fish is capable of laying up to 40,000 eggs within a season, of which approximately 25-35% will survive to adulthood under current conditions. SCP-1238 hatchlings reach sexual maturity after approximately 10 years and have been documented to live up to approximately 35 years in the wild. SCP-1238 specimens almost always return to the tunnel in which they were born in order to spawn, with tens of thousands of individual specimens involved in digging a single tunnel. SCP-1238 will continue to expand on a specific tunnel, occasionally forming branching tunnels, until natural phenomena cause the tunnel to collapse, population growth results in excessive competition for resources, or the food supply becomes inadequate. Individual SCP-1238 tunnels have been documented to extend as far as ████ km from their starting point and as deep as █ km below surface level. Map of northwestern United States and western Canada depicting approximate projected flooding as a result of Event 638-Mu-34. Global sea level adjustment as a result of flooding not represented. Prior to the late 19th century, the environmental impact of SCP-1238 was largely self-contained. The widespread commercial exploitation of the northern Pacific since then has resulted in the depopulation or extinction of several cetaceans and other species that previously preyed on SCP-1238, and as a result, SCP-1238's population has increased exponentially since 1850 and continues to do so to this day. In particular, tunnel construction has increased dramatically as the result of this overpopulation. Whereas we believe that approximately 200 km worth of tunnels existed in 1850, tunneling has now accelerated far beyond the rate at which natural geologic events cause tunnel collapse. We currently estimate that there are approximately ██████ km of tunnels in existence, extending up to ███ km inland from the Pacific coast, spread throughout a region of the northwestern US and southern Canada designated the Gold Zone. Damage to these tunnels has resulted in an increasing number of sinkholes and other anomalous phenomena on the surface, including the allegedly bottomless sinkhole referred to as "Mel's Hole". Computer modeling indicates that the collapse of one of the larger tunnels, or a major earthquake occurring along the [REDACTED] or [REDACTED] fault lines, could potentially cause a chain reaction (designated Event 638-Mu-34) ultimately resulting in the complete collapse of the tunnel network, the partial collapse of the continental shelf, and the permanent flooding of a large area of the Gold Zone by the Pacific Ocean to depths of up to ███ meters. If SCP-1238 tunneling continues to accelerate at current rates, our models predict a high probability of Event 638-Mu-34 occurring no later than 20██. Even if all SCP-1238 tunneling were to cease immediately, a high probability remains of Event 638-Mu-34 occurring within the next █00 years. With our current methods of seismic analysis, we believe the Foundation would be able to predict the onset of Event 638-Mu-34 no sooner than sixty minutes prior to the beginning of tunnel collapse, with continental shelf collapse occurring over the next twelve hours and complete flooding following over the next several weeks. Our models predict that few people residing within the Gold Zone, if any, would be able to evacuate upon the onset of Event 638-Mu-34; were the event to occur tomorrow, we would predict approximately ██ million human casualties within 24 hours and the destruction of approximately ██████ sq km of land, the complete destruction of the cities of Boise, Olympia, Portland, Sacramento, Salem, San Francisco, Seattle, Spokane, Vancouver, and Victoria among others, and an unquantifiably large amount of property damage. The immediate results of Event 638-Mu-34 are likely to cause a mass extinction of land and aquatic flora and fauna within and near the Gold Zone (including SCP-1238 itself) due to destruction of habitats, and will produce lingering effects for decades due to the introduction of pollution in the form of chemical and nuclear waste, debris from man-made artifacts, and large quantities of human and animal remains into the Pacific Ocean. As much of the Gold Zone is currently employed as farmland, a significant percentage of the United States food supply is likely to be impacted. We predict massive spikes in the price of food, oil, consumer goods, and other commodities as a result. Hinterlands neighboring the flooded regions of the Gold Zone are likely to suffer immediate economic devastation as a result of being cut off from the outside world; rapid onset of famine and communicable disease is expected as a result. We predict a global adjustment in sea level of approximately █ meters as the result of water displacement into the Gold Zone and major tsunami activity throughout the Pacific rim. This change will produce a significant impact on international maritime commerce and fishing, and may possibly contribute to a global economic or political crisis due to the sudden inaccessibility of vital resources. Global telecommunications are likely to be severely impacted due to the loss of telecommunications infrastructure within the Gold Zone and a massive spike in civilian communications via phone, email, social networking etc. during and in the immediate aftermath of Event 638-Mu-34. It is therefore our opinion at this time that if and when Event 638-Mu-34 occurs, the Foundation must devote as much of its resources as possible to continuity of operations and maintaining global and economic security. The unrest and devastation likely as a result has the potential to escalate into an IK-Class event, which will severely compromise the Foundation's ability to keep other SCP objects under containment and protect the human race from their influence. In the meantime, mass eradication of SCP-1238 populations will slow the acceleration of new tunneling, buying the Foundation time to develop a more permanent means of staving off that which is currently inevitable. We additionally suggest that our media resources foster the evolution of a "sustainable" culture within the Gold Zone in order to encourage population decentralization, the movement of vital technological/industrial/military resources away from the Gold Zone, and allow populations of SCP-1238's natural predators to rebound. Postscript: Per our previous discussion with the Central Ethics Committee, O5-8 has been deliberately excluded from this memo and will not be made aware of Event 638-Mu-34 at this time. The circumstances of O5-8's early life and education, and the current residence of his extended family within the Gold Zone, may present a conflict of interest if O5-8 is made aware of the threat at this time.